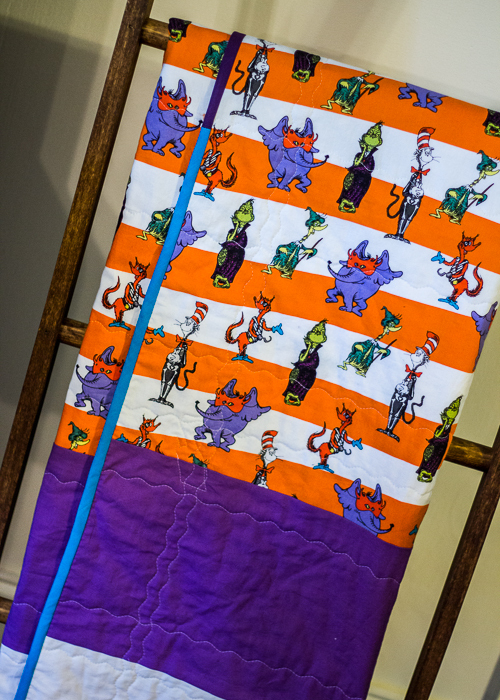 Here’s the second project I made with the Spooktacular Seuss fabric. You can see the first project here. 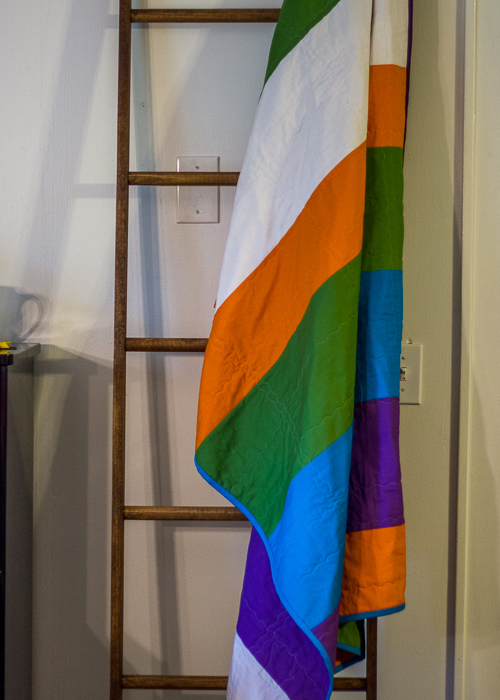 I wanted to make something that we could enjoy for longer than one season so a quilt seemed like the logical choice. I don’t quilt very often but it is fun to have holiday themed quilts. I actually made a Grinch one last year that I never blogged so I’ll try to get pics of that this season! You will notice, I’m not an intricate piecer. My sewing time is so limited and Halloween was coming so quickly that in order to get this finished, I needed to do something quick and easy. While fancy quilts are nice, in my house they never get completed! I decided to have fun with the Suess theme and go with stripes of various widths and colors- pulling from the colors in the main fabric. I found all of these Kona cottons as my local Hobby Lobby. They don’t have a huge selection but they are close by my house so I was happy to see that they had exactly the colors I needed. I got a half yard of each fabric and cut a few different widths to get the length I wanted for the quilt. 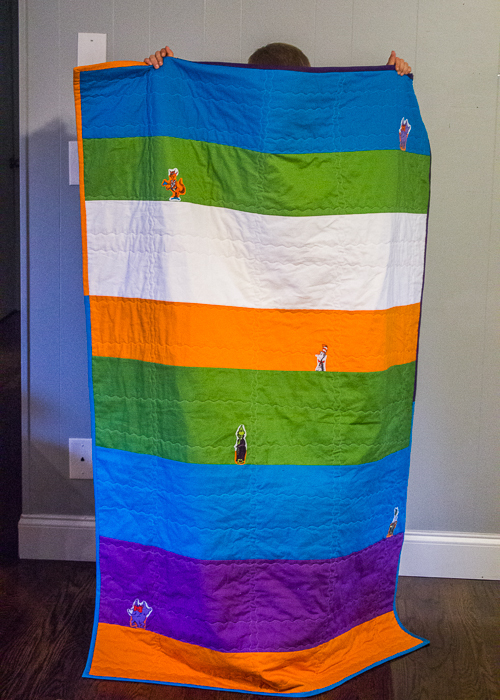 I used the entire width of the fabric to make the quilt as wide as possible. It ends up being a great lap quilt size about 41×62″. Once I had the front pieced, I used up all the remaining Konas for a random striping back. I didn’t even lay the colors out beforehand- just picked up the next one in line and sewed them all up. I love how fun the back turned out! 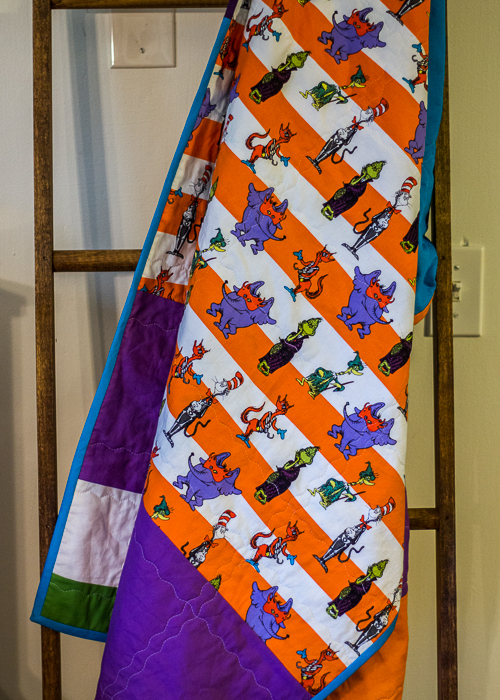 I had a few little Seuss people left from the boys’ applique shirts so I appliquéd them to the back of the quilt to give the boys something fun to look for and give the back a little more interest. 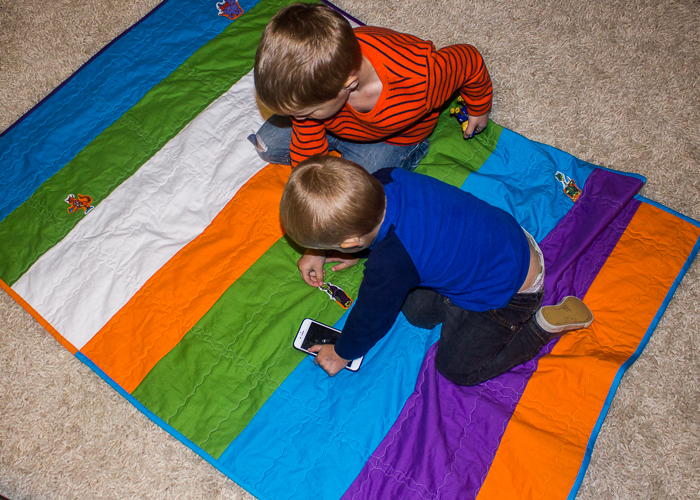 I can’t decide if I’m 100% sold on whether they add to or take away from the quilt, but the boys really like them so that fulfilled my main purpose. I used a curvy stitch on my machine to quilt lines at random widths across the quilt. That meant I didn’t have to stress about how even my lines were, plus the waviness adds to the Seuss effect. 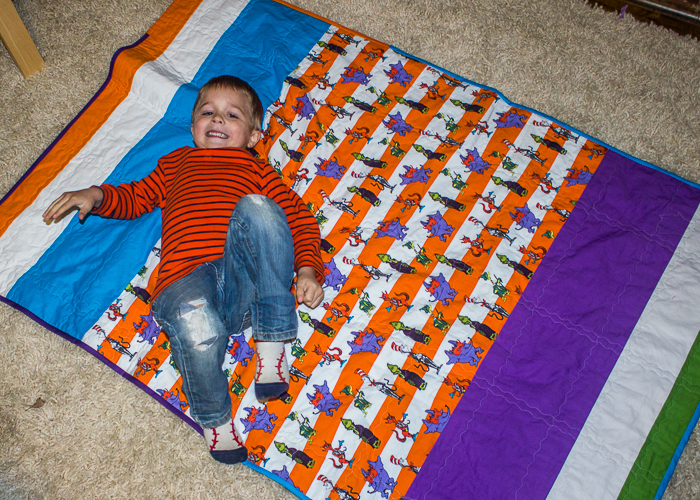 The binding is pieced from random leftover bits I had on hand- aqua, purple and orange. It’s the first time I’ve done a pieced binding and I kinda love it! Checking back in here again to let you know I am still alive and baby is still happily swimming around his little cocoon. 🙂 39 weeks tomorrow and trying to relax and not anticipate his arrival any second…soo hard to do! Well I hadn’t sewed in over a week because I am just so tired at nap-times that I take naps myself. My poor Bernina was looking so sad and neglected I just had to give her some attention yesterday! 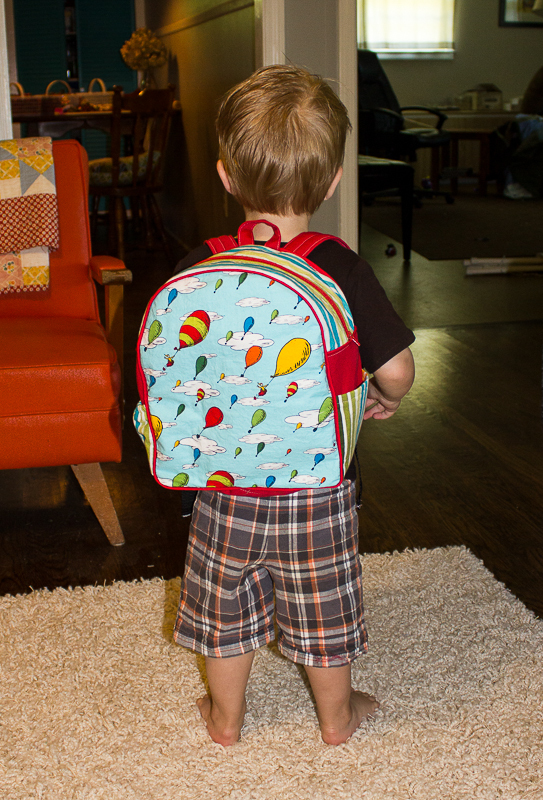 A few weeks back I had started a toddler backpack for Oliver using Rae’s pattern and some Dr. Seuss fabric I have been saving for just the right project. 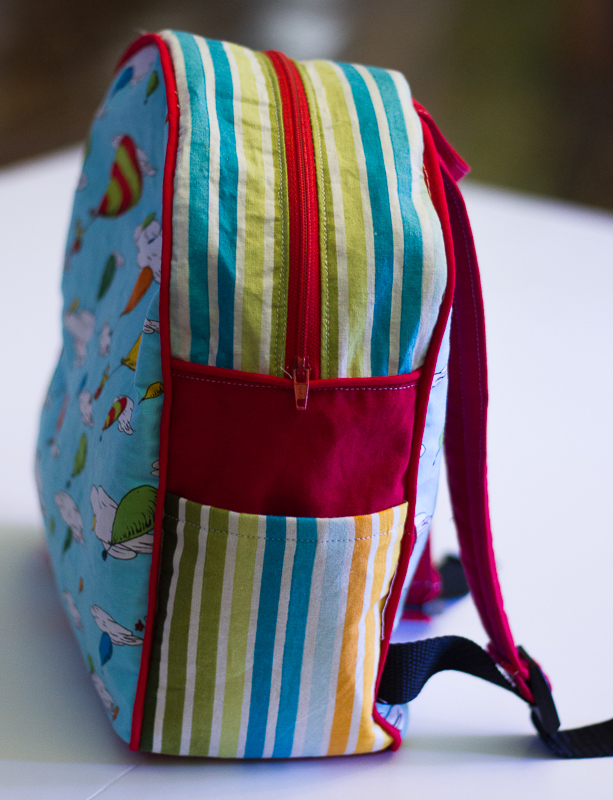 I got the outer backpack all finished and there it has been sitting waiting for a lining. 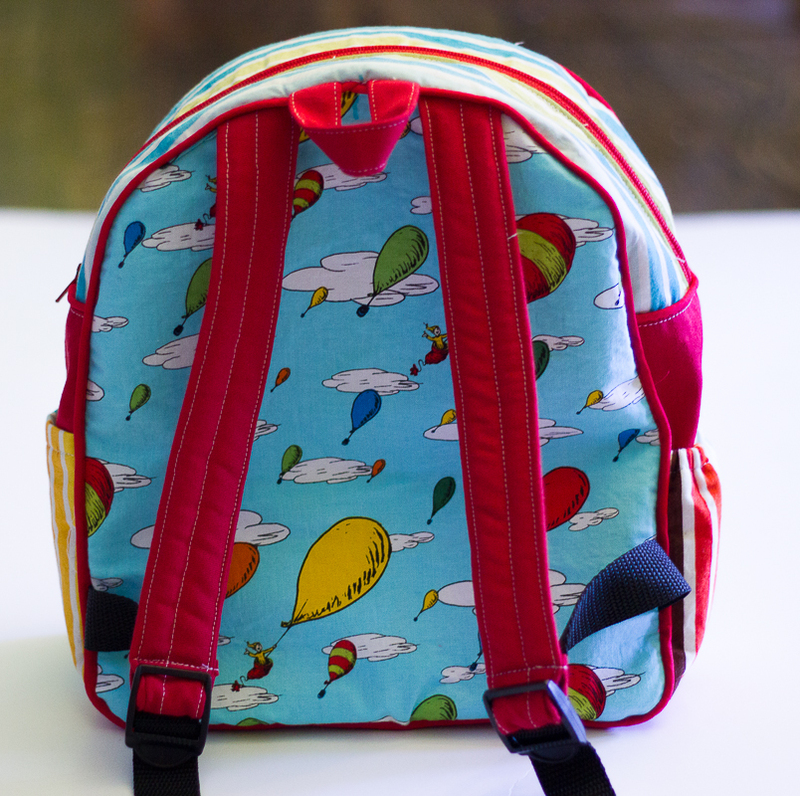 Really happy I got to finish it yesterday because Oliver’s old backpack (also Dr. Suess 🙂 ) was a cheap nylon bag, and it is all but in shreds so he really needed a new one. I used Craft Fuse 808 to interface all the exterior pieces because they are quilting cotton weight. 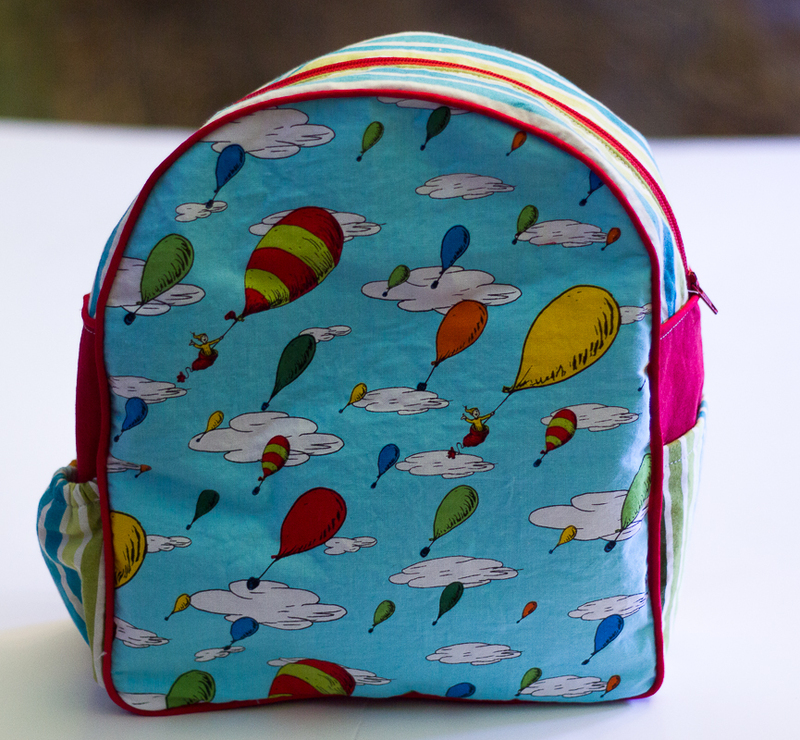 The lining is a medium weight twill fabric. I was worried it wouldn’t be sturdy enough but am happy to report that the interfacing and heavier weight lining combined to make a great sturdy bag! 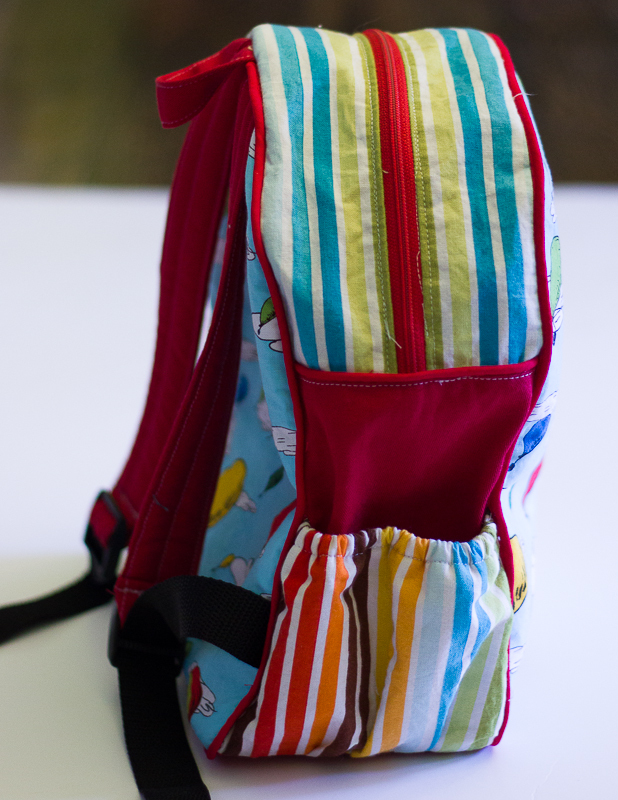 Now about the bag construction itself- This bag pattern is not for the faint of heart! It has quite the involved instructions and takes a bit of time to construct. However, like all of Rae’s patterns, the instructions are well-written and easy to follow- just be prepared to take your time. I am especially impressed with how professional-looking the strap turned out! I got to use some of my new feet for the bag construction and really liked how easy the piping foot made that section come together. 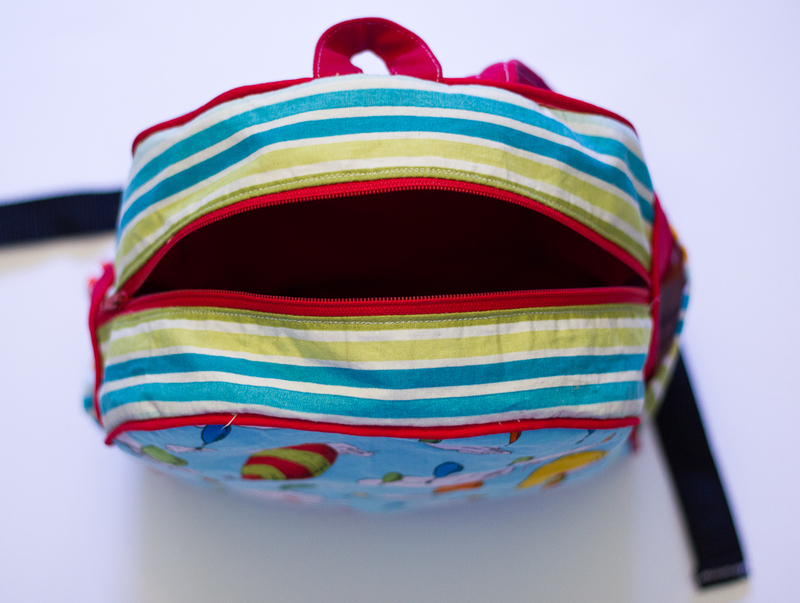 I also looked through the flickr group before making my bag in order to get some ideas and decided to add pockets to each side panel. They were pretty straight-forward and easy to add except that I think the gathered one needs to be just a bit bigger in order to hold his water bottle. 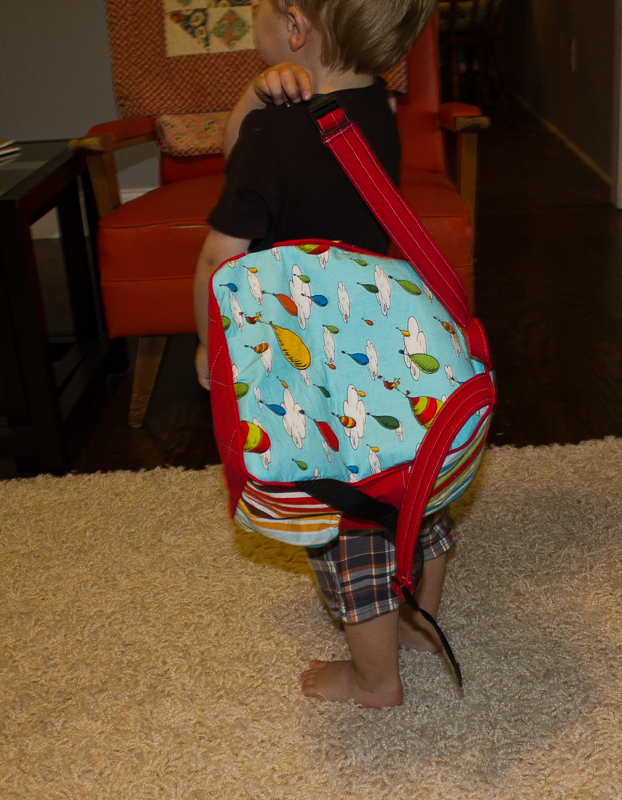 Oliver loves his new bag and likes to carry it around one-handed to show people…kinda cool that he’s old enough to appreciate what I make for him now! This week’s challenge was to make clothing using a white sheet as the main resource. 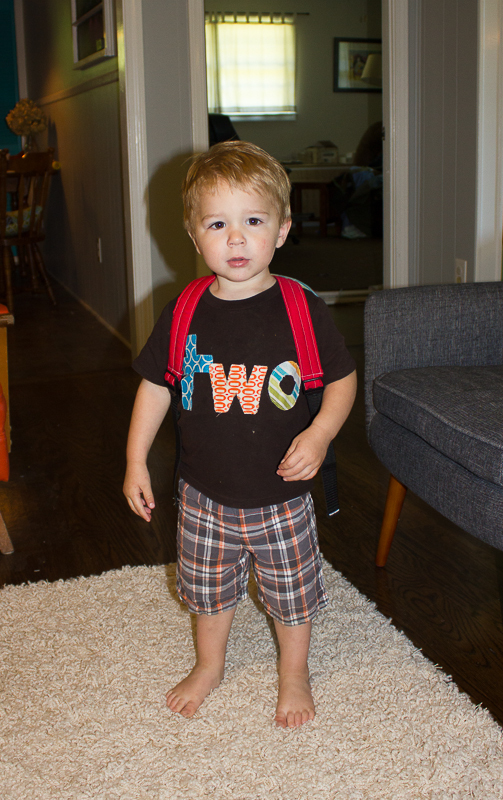 I brainstormed for quite a bit about what to make for my little man. I knew that white pants would not really look that great, and a white shirt is a little boring. Hey, what about pajamas? I thought that would be a fun idea- kinda mixing up the whole white sheet idea. You know, sheets go on your bed, and you wear pajamas to bed. Ok, ok you get it; maybe not as funny as I think it is? Anywho I remembered Rae had made some cute pjs for her munchkins a while back, and a quick google search led me to the Oliver + S bedtime story pj pattern. Thank goodness they are offering it as a PDF download now! I plunged right into my first Oliver + S pattern, and, let me tell ya peeps, they do not disappoint! Very well written and easy to follow along. I flew through the construction of these! I see many more Oliver + S patterns in my future! I knew I wanted to do a fun contrasting trim to offset the white fabric on the pjs, so I chose this Robert Kaufman stripe from his Dr. Seuss line. I originally thought I would do more embellishing of the outfit- using my Thing1&2 fabric, but I decided I liked it more simple. I did add a little applique to the side as a nod to my inspiration.